If you follow the STEAM Powered Family Instagram, you know our family grew by two recently with the addition of two adorable kittens named Potter and Weasley. We are completely smitten with these two. They are a complete riot, love to snuggle and purr like little jet engines. Best of all, the kids are learning that kitten babies are a lot of work! It’s been an amazing experience and a lot of lessons are being learned. Best of all, it has renewed our love of Harry Potter inspired some great activities. 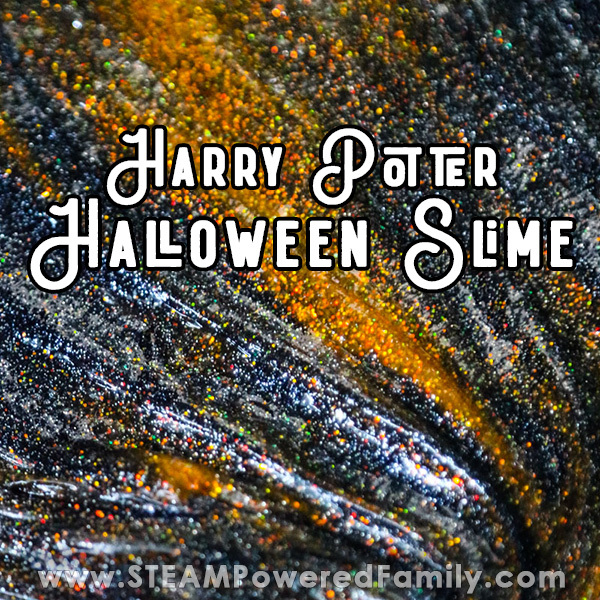 Like this Harry Potter Halloween slime! Now most people would say this is a Halloween slime. Which it absolutely could be, but in our home we think these slimes are a fun way to celebrate our new kitties! Weasley our ginger tabby and Potter our black tabby. 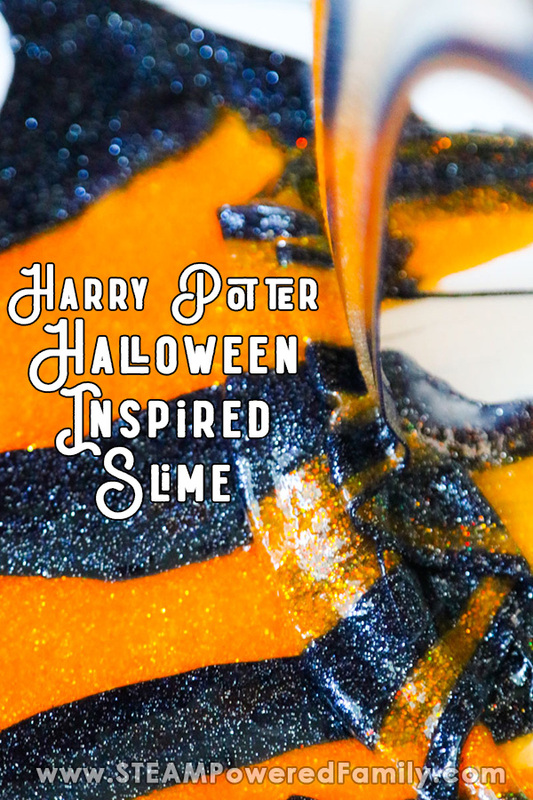 Plus anything inspired by Harry Potter, especially Harry Potter inspired slime, is always cool. I guess our love of Harry is pretty obvious from the name choices, huh? That said, it also makes an awesome Halloween slime and we LOVE our Halloween Activities around here. So double the slime win! Now a simple orange and black slime is not enough to do our kittens and Harry Potter justice. It needs to have some MAGIC! Also known as sparkly glitter. So to make this slime we are using our usual recipe with one big swap. To make this slime you will need Elmers Glitter Glue in Orange and Black, plus our usual activators of buffered saline and baking soda. A LOVE OF HARRY POTTER AND HALLOWEEN! We are going to make our Potter slime (aka black glitter slime) first. Empty your 6oz bottle of glitter glue into the bowl. Add 1/2 teaspoon of baking soda and mix well. Now add about 1 teaspoon of the buffered saline and mix well. You will notice it start to pull together and away from the sides of the bowl after about a minute of stirring. If it doesn’t pull from the sides of the bowl, add another 1/4 teaspoon and mix well. Once it starts to pull into a lump pull it out and start kneading with your hands. To make this easier add a couple drops of the saline to your hands first. This stage is a good workout for your hands! Kneading it important to ensure you get a really nice stretchy slime. If your slime starts breaking you added too much buffered saline and need to use less next time. Check out how gorgeous this glittery black slime is! 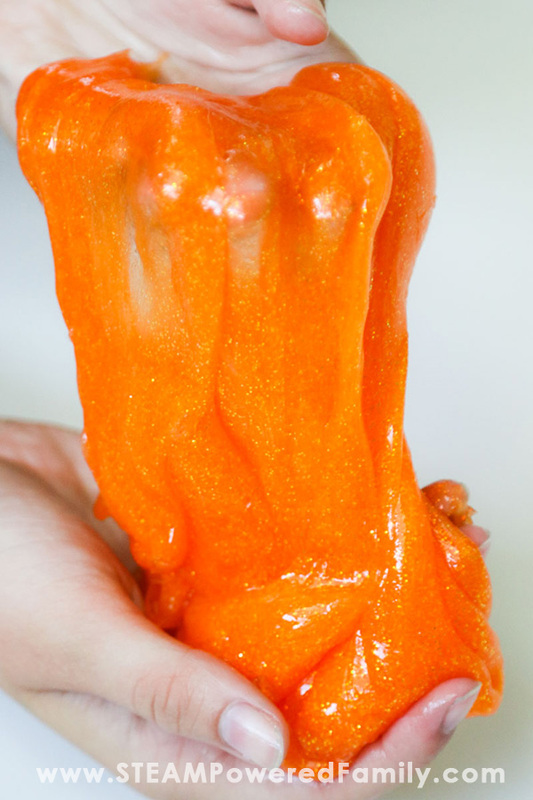 Now repeat all the above steps but using orange glitter glue to create your Weasley Orange Halloween Slime. 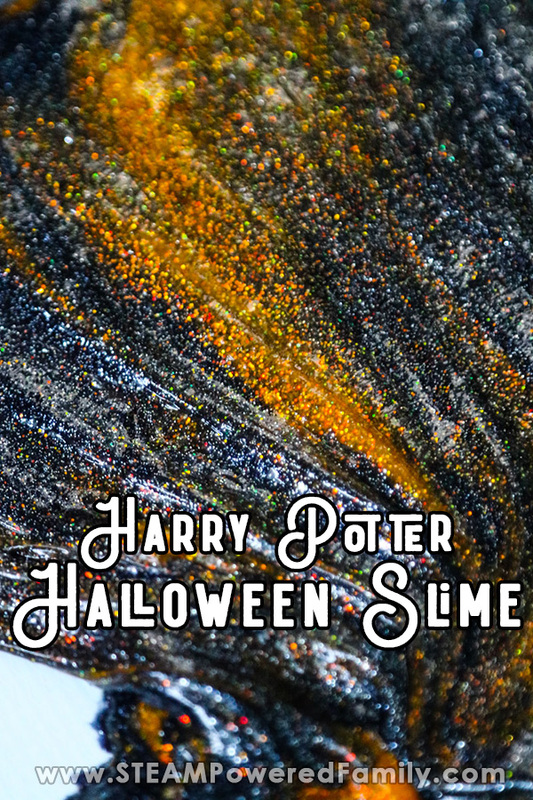 Mix the two together to get a gorgeous slime that is perfect for the Harry Potter fan or Halloween! Mixing them together is when the magic happens. They blend into this amazing creation that will have kids playing for hours and celebrating everything Harry Potter and Halloween! Pair this slime with our Glow in the Dark Slime and you have the makings for some awesome additions to your Halloween party plans!